We’ve all heard that before. We can never have too many reminders to give ourselves permission. Our minds want to keep us in what they know; space allows our deeper wisdom to emerge. It’s so easy to busy ourselves with activities, enjoying the stimulus of uplifting people. So actively programming in quiet, personal and reflective time, allows our own deep wisdom to emerge. It helps us be the observer of our life, rather than being caught up in to-do lists and routines. Space gives us flexibility, receptivity to change and allows us to listen to our deeper knowing. Of course I’m writing about me, but it could apply to you too… so I am taking time out from my daily life including the internet from December 8th to January 15th, which will be a big change for me. I’m grateful to have the opportunity to return to a Casa de Dom Inacio in Brazil, which I haven’t visited for eight years, to see an extraordinary person in an extraordinary place. It is recommended that you take a guide, if you are going for the first time, this is a very comprehensive website, though I have no personal experience of the author as a guide. To see more guides, please click here. So see you all in the new year refreshed and renewed! Wishing you a great time over the holiday season wherever you are. Over and over again people were giving me the same messages but I wasn’t listening fully until now! Finally, the ‘penny dropped!’ I received so many synchronicities – amazing conversations and chance meetings, and so much encouragement from people I began to change my thinking. 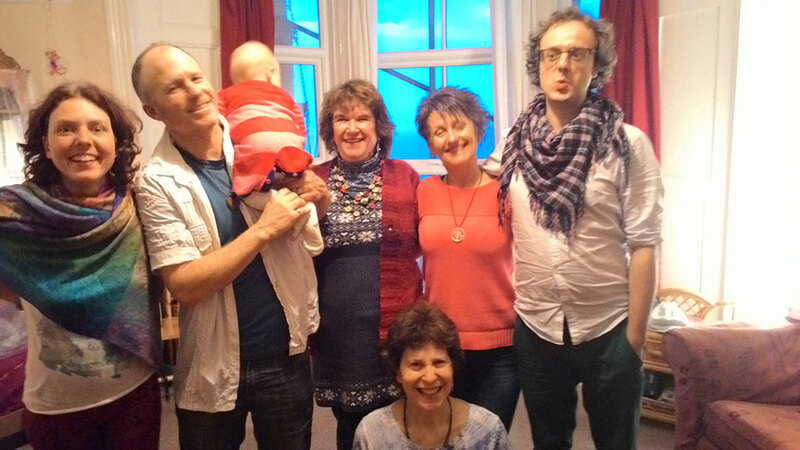 I love freeing the child within the adult in my groups and individual sessions. My happiest times are when improvising words and melodies sharing with other people in that special zone of uninhibited creativity. I started to feel excited about helping children build confidence in their own unique voice. Most of the difficulties my clients bring to me stem from childhood conditioning. But I was wondering how to take the first step! Then I met up with Julie Jurgan who runs a great online marketing network, Blossom of the Soul, and offered to help promote my first event. Now on October 21st I’m giving my first session for young people aged 5-12 at the Earthbeat Centre. I love the title (“Sounding Stars”) We are all stars in our own special way! It’s good to help people realise it from a young age especially as it took me such a long time to know it. As more and more people value their uniqueness and share their gifts together uniting through sound and an appreciation for the joy of life what a difference it will make in the world!!! In 1992 – an incredible 25 years ago long before the advent of social media and the digital music revolution – I was given some words and tunes. This “Beauty” was inspired by visiting Kew Gardens, when I lived in London, and was feeling lost after a relationship breakup. The grandeur of the Autumn landscape comforted my grieving heart reminding me of the beauty of the world. I carried the creation of this moving song with a commitment to myself to record it one day and share its wonder as widely as possible. Other words and tunes presented themselves to me. In those days I “doodled” on the guitar until shoulder issues prevented me playing. Years of spinal difficulties and ill health (including mercury poisoning) prevented me moving forward with this dream. I spent time in Southern Spain during several winters helping me recover my wellbeing. Falling in love with a special village “La Herradura” gave birth to a 2010 composition “Village in Andaluz“. There a miraculous event occurred, beyond anything I could have imagined. I met a former EMI professional songwriter who believed in my natural songs and pure voice and literally tuned into my compositions. He arranged my melodies and recorded my voice. This was no simple achievement. If you have ever experienced performance anxiety you will identify! A dry mouth, tense body, doesn’t make for easy recording as my self-confidence would disappear when the recording button was switched on! Running groups my focus was on helping others to feel relaxed. Here in a recording studio with only my headphones, the room and a sound engineer demanding precise time-keeping I would freeze with fear and forget all the playful joy of writing the songs! Of course confidence only comes from taking a chance and facing fears. I knew I could help others free their voices. I had lots of success from facilitating healing through the vibration of my voice. What I lacked was confidence and experience in my singing voice. The digital age and market place are constantly changing. Now when I google “Suzi Joy Lever” it is a delight to see all the links. My early songs were mainly written in a minor key but always with optimistic lyrics. There are many more recorded and ones waiting to be written. My singing voice has gained in confidence reflected in the progression of songwriting range. My initial fears of letting other people hear them dissolved as positive feedback encouraged me to move forward with sharing them. While they have a simplicity and are easy listening, listeners report that the more they play them the more depth they experience. I want to help empower other people through my life’s experiences. I’ve always loved butterflies. For me they are a powerful symbol of transformation, and part of my logo for over 15 years. Now I’m seeing them everywhere. Delighted to see that my favourite organic skincare company Green People have not only launched a new butterfly range but are also donating 10% to Butterfly conservation. Now I’m enjoying sharing my animated butterfly thanks to the skills of Carolanne Barnard. I’ve always been entranced by the colours of butterflies and received many special personal experiences. 25 years ago I was on a year’s shamanic training which confirmed my instinctive love of ceremony and symbolism. Our western “tribe” searching for a suitable name received a visit from a butterfly on a cold dull March day which refused to leave the shoulder of a member until we acknowledged it’s message for us. Being part of that Butterfly tribe was a catalyst for my songwriting and opening to my natural voice. The course was facilitated by Leo Rutherford of Eagles Wing, a dear friend and a spiritual mentor to me. For those of you who want to know more about butterflies and why they appeal to so many people I’ve discovered two informative books published in 2005. One exploring the social history and our celebration of butterflies has a wonderful name “Rainbow Dust” by Peter Marren. The author’s description of his first magical encounter at the age of 5 years which marked the beginning of his life as a naturalist. The second book is also a nostalgic memoir. “In pursuit of butterflies” a fifty-year affair by Matthew Oates, another Naturalist who wanted to share his own love of Nature written “with a poet’s mind”. 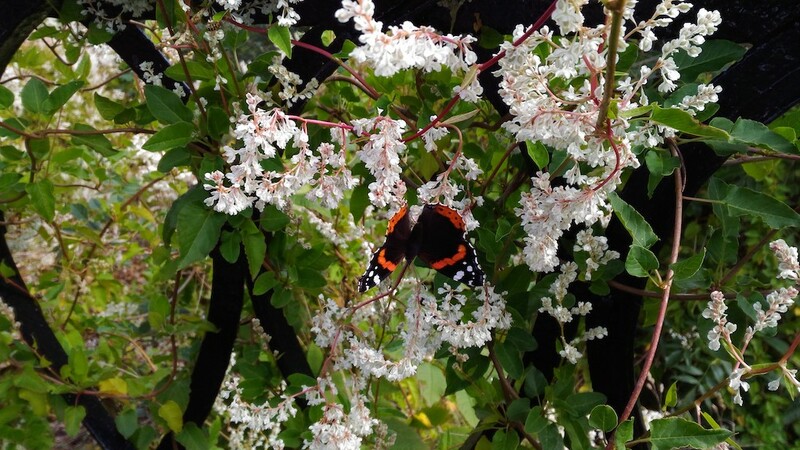 And the inspiration for this blog was this beautiful butterfly (above) who caught my attention, when I felt drawn to sit in a non-habitual place in Saltburn, North East England in October. Only after I acknowledged the butterfly and took the photo did it fly on! Thank you! Some of you know that I am planning to offer Vlogs to those of you who subscribe to my email list. So I thought “VLOGS that sounds fun” before I even know what the word meant. It will be great to have the opportunity to share more widely tips that I do so easily in groups and individual sessions especially as the same questions get asked over and over again. But I reckoned without technology. I am not a natural tekkie. It doesn’t come naturally to me. I’m not like the 10 year old whose proud grandmother told me taught himself to upload his original video on dinosaurs onto Youtube. He’d previously asked his mother who didn’t know how to show him! I discovered there is a lot more involved than I’d realised. Apart from technology issues which I won’t bore you with, except to say, I didn’t want to be my own movie director simply focus on content. Then there’s the question of me! My insecurities. Am I good enough? I’m always teaching about non self-judgment with sound. I’m certainly not perfect. We teach what we need to learn. The more I focus on what helps me the better I feel. That’s what’s so great about sharing. I get a lot of prompts of what and how to say things from “reading” people’s body-language. I can see where people are holding tension and offer suggestions and help them lighten up. Very different talking to a videocamera on my own. Then there is what do I wear? As you will know if you follow me regularly I love colour but too much can be distracting. My own wise words recorded in Miracle of Life in the final verse. Just to say I will be doing it. Ideas and enthusiasm are still bubbling away. Don’t have a timescale at this point. I will find time to learn how to use Mailchimp to send it out to you as a subscriber. Please help me by registering your interest. Love to hear from you if there is anything particular you would like me to share. my theme is tips for freeing your authentic voice. What an exciting week! So happy to have my new animated logo and pic uploaded on my home page on Monday. Expresses so much more of what I am about. Tuesday I walked 100 yards from my home with intention to sit and clear my head outside and take a few minutes to meditate before I tackled my to do list. 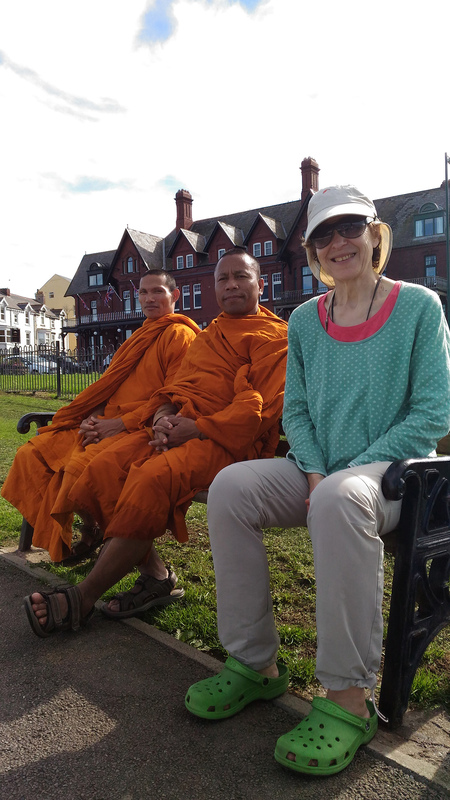 Suddenly 6 Buddhist Monks from Thailand appeared in Saltburn!! They are visiting a new monastery in Leeds. Wednesday went into Middlesbrough running some fear thoughts I wanted to change. My heart opened went I saw Pablo Woodward Street Artist the “Disco Bunny” perform getting people smiling and connecting. Had a great conversation with him. Certainly plugged me back into my desire to smile and share with strangers. Believe he is on a great mission. View this Youtube clip if you haven’t already and share it where you can. All my life I’ve been terrified of performance, it’s great moving beyond that. Suzi came along and was very nervous, she did really well considering how scared she was, but Suzi, “felt the fear and did it anyway”! Friends joining me at my birthday to enjoy sound together. I will soon be launching a weekly vlog so that you can experience sound with me wherever you live. Watch this space for how to subscribe.